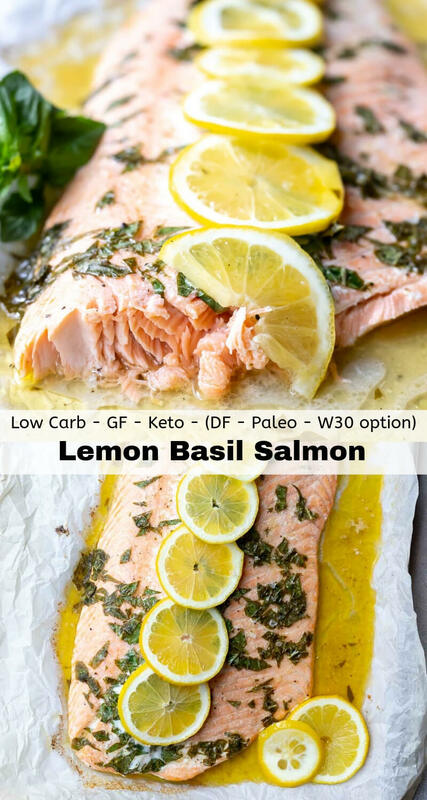 If you’re looking for a new twist on your baked salmon dinner, try this Lemon Basil Salmon Recipe. A simple combo of lemon, fresh basil and butter makes this meal extra flavorful. Substitute olive oil for the butter and you have a dairy free version. 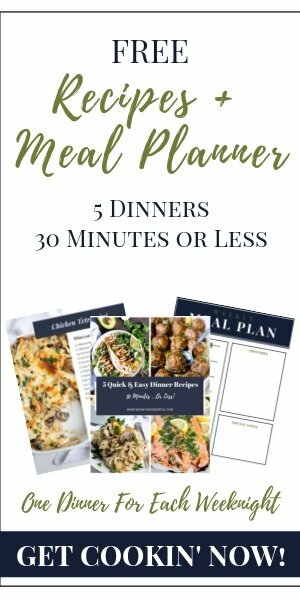 This recipe is low carb, Keto friendly, gluten free with Whole30 Paleo option. I am gearing up for those delicious summertime meals. If you are lucky enough to have a green thumb, you probably have an abundance of fresh basil every summer. When I first tried basil with salmon I wasn’t sure if the flavors were going to work. But they totally work together better than I could’ve imagined. The lemon just brings it all together. I bake my salmon at 375ºF for 10 minutes then broil on high the last 5-6 minutes until the salmon is cooked through. This will vary depending on the size and thickness. If you are baking pre-portioned salmon fillets they may be done even sooner. Test the thickest part of the middle. When salmon is cooked through it will no longer be shiny and reddish inside. It will have turned pink like the outside and begin to flake apart with a fork. Veggies, rice or pasta sides will all go nicely with this salmon. Here are a few side dish recipes ideas for you: Parmesan Basil Corn on the Cob, Oven Roasted Asparagus, Avocado Tomato Salad, Cucumber Greek Salad or Baked Parmesan Tomatoes. 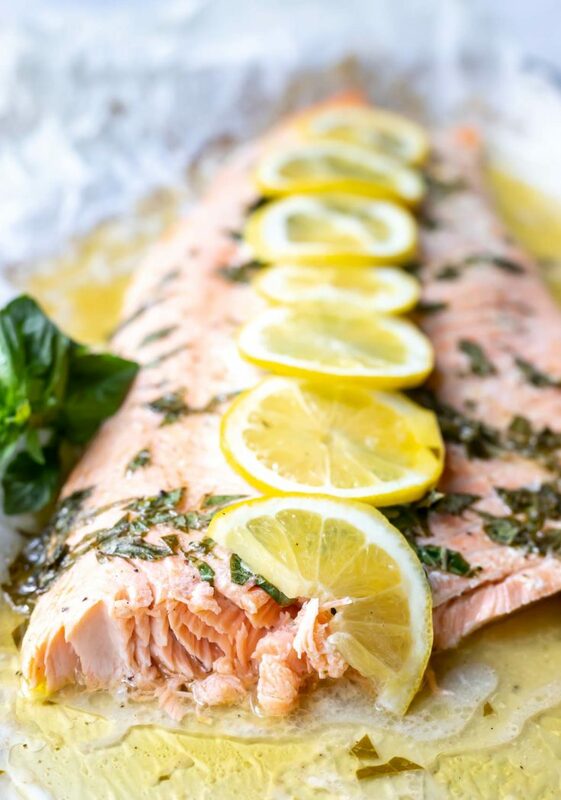 Place salmon on rimmed baking sheet lined with parchment paper. Coat salmon with oil and a pinch of salt. While salmon is baking, mix melted butter, lemon juice, basil, salt and pepper. 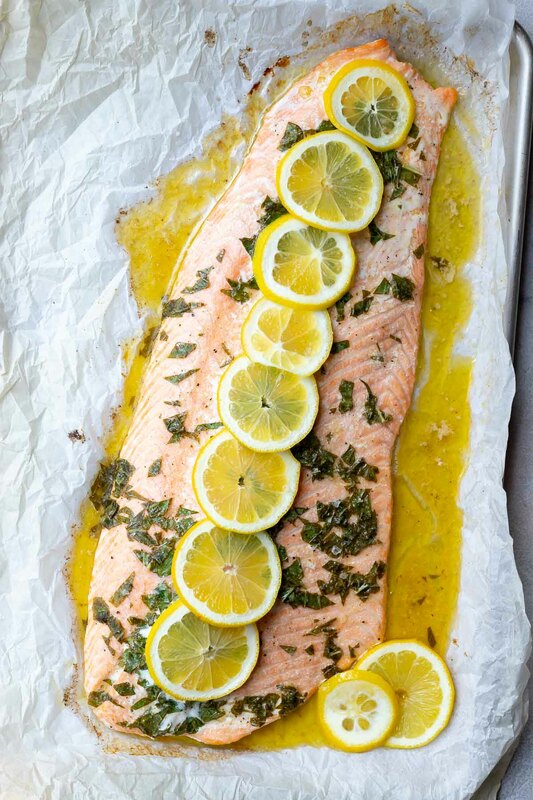 After salmon has been baking for 10 minutes, spoon basil butter mixture over the salmon and top with sliced lemons. Broil on high for 5-6 minutes or until salmon is cooked through. 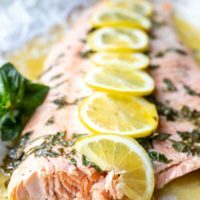 If you're looking for a new twist on your baked salmon dinner, try this Lemon Basil Salmon Recipe. A simple combo of lemon, fresh basil and butter makes this meal extra flavorful. Substitute olive oil for the butter and you have a dairy free version. Coast salmon with oil and a pinch of salt.